Print La Nuit Trésor À La Folie perfume for women embodies the one and only moment when true love is at its climax. A unique moment of “lâcher prise”, meaning, when time is suspended. Lovers are transcended beyond themselves and experience the thrill of love: an indescribable feeling that makes you forget everything and lose control. Discover the Trésor family: Trésor, Trésor Eau de Toilette, and La Nuit Trésor. Print La Nuit Trésor À La Folie perfume is made with dazzling raw materials: a burning heart of Rose Essence, inflamed by the sensuous addiction of Bourbon Vanilla and intensified by smouldering Patchouli Essence. 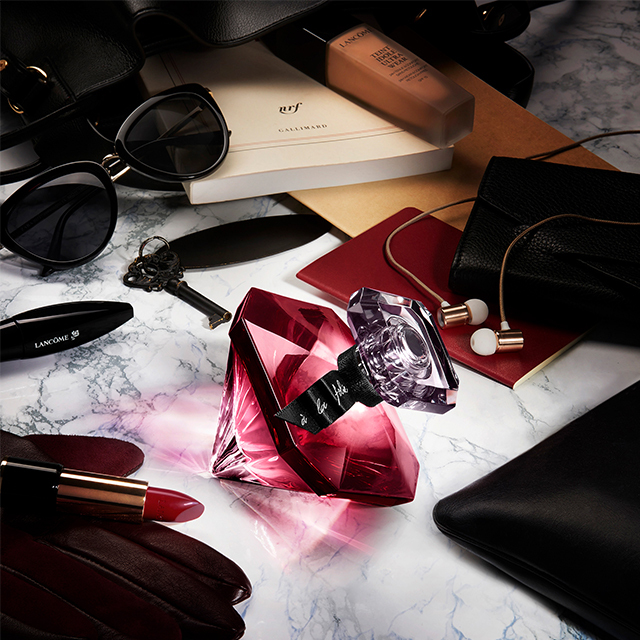 Print A new jewel in the Trésor family: an exquisite ruby diamond, energised and fiery, finished with a black ribbon. Overwhelming and extremely sensual, the great thrill of love is perfectly embodied by the fiery rose. This rose joins the Trésor roseraie, very sensual and addictive. The perfume opens on an opulent Vanilla elixir and a woody patchouli drydown. THE TENDERNESS OF A REUNION MADE OF MAJESTIC ROSE, PEACH AND LEATHER. THE THRILL OF LOVE MADE OF FIERY ROSE AND VANILLA ELIXIR. A CAPTIVATING GAME OF LOVE MADE OF APHRODIASIAC ROSE AND VANILLA ORCHID. Start by a perfect-looking complexion with Teint Idole Ultra Wear. Apply a small amount of foundation onto hydrated skin, starting with the T-zone. Using a brush or fingertips, spread the foundation to the hair and jaw for a natural, flawless look. Pump up your lash volume with Hypnôse mascara. Apply on the eyelashes from root to tip. Perform a zigzag movement for maximum volume and separation. Wrap your lips in rich, satiny color with Absolu Rouge. First define your lips before applying your favorite shade. A touch of La Nuit Trésor à la Folie for endless promises.